The infamous garage band I led in high school named the “No Left Turns” had a rather “deflating” experience some 48 years ago. It was a sultry night in late August. 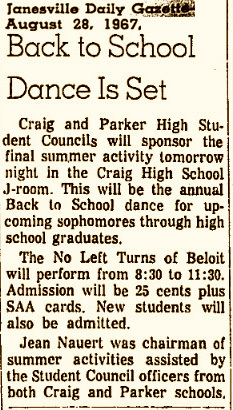 Ken, our booking agent, got us a gig at Janesville Craig High School for a back-to-school dance. We were fortunate to have a booking agent, though I don’t think any of us really knew what percentage he was taking for himself. We were just grateful to have someone finding us work, sending us a contract and leaving us to do the job. Not to brag or anything, but among Ken’s stable of bands was a Rockford group who, a few years later, became Cheap Trick. Ken was their exclusive manager for quite a long time. It’s something I look back on with a tiny glimmer of pride, though our musical paths never crossed. Back at Craig High School the dance was going swimmingly. We had everyone up and rocking to songs by the Rascals and the Rolling Stones among others. Two of our favorites were versions of In the Midnight Hour and (Just Like) Romeo and Juliet as they were covered by Michael & the Messengers. After the dance was over and we had collected our fee, we broke down our gear and hauled it out to load on the trailer hitched to my 1962 Studebaker Lark. During the ten-mile drive back home to Beloit I felt some serious vibrations coming from the trailer. We were on the outskirts of town, anticipating our usual after-gig ritual of heading to the Hollywood Drive-In for fish ’n chips dinners. I pulled over into the parking lot of a nearly deserted bar. Getting out to examine the trailer we noticed one of its tires was especially low. Upon closer examination, we discovered the lug nuts on that same wheel had been loosened. It was a couple of minutes before we found a wrench to tighten up the lug nuts. That sewn up, we proceeded cautiously to the nearest service station on the way to the drive-in. There we re-inflated the low tire, checked the others, topped off the gas tank, and then blasted off to feast on greasy fish and french fries. The No Left Turns survived an intentional deflation attempt without further incident and with nary a quarterback involved.